Tasting notes: Bright and lively. Tropical fruit and hibiscus. 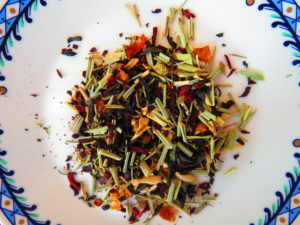 Ingredients: Rainforest Alliance Kenyan Purple Leaf Tea, Organic Lemongrass, Hibiscus, Apple Pieces, Rosehips, Passion Fruit. Did you know that all tea comes from the jade green leaves of the tea tree, except for purple tea? This unique variety yields beautiful, vibrant purple leaves! Grown organically, these tea leaves are naturally purple because they contain anthocyanins, the same super antioxidants found in other purple plants like blueberries and pomegranates. Similar to green tea, Purple Tea is very healthy, with little caffeine and an exquisite taste. Your tea purchase directly employs Kenyan tea farmers.